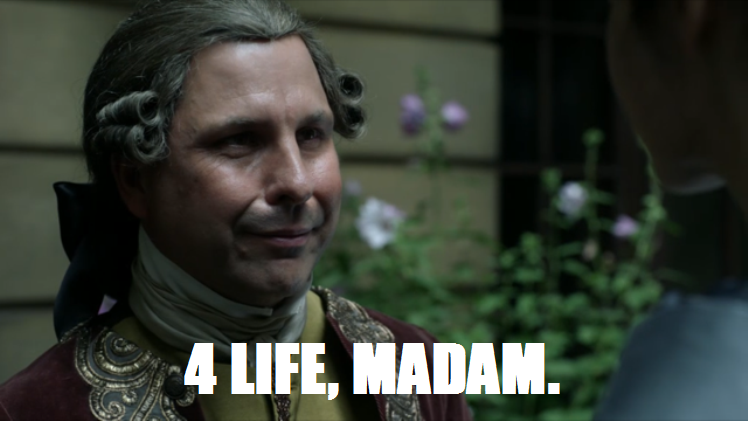 Oh, Outlander. What you do to me! 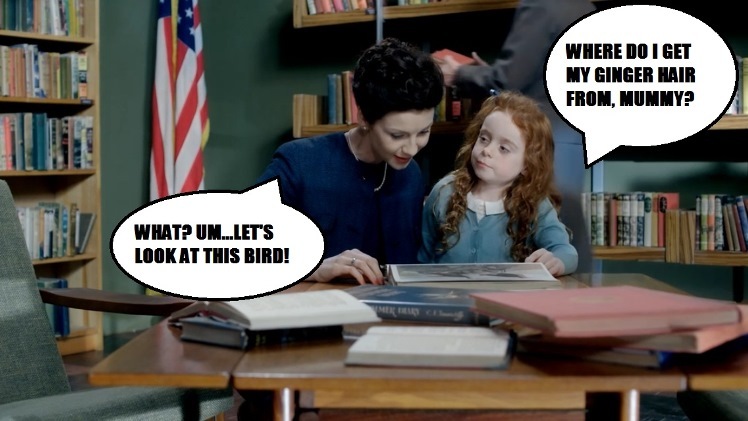 Just when it seemed this season couldn’t get any better, we were doused with a big old heaping of “Faith.” Despite a serious lack of Jamie, Episode 207 was my favorite episode to date, giving further proof that Caitriona Balfe is seriously THE. BEST. ACTRESS. IMAGINABLE. 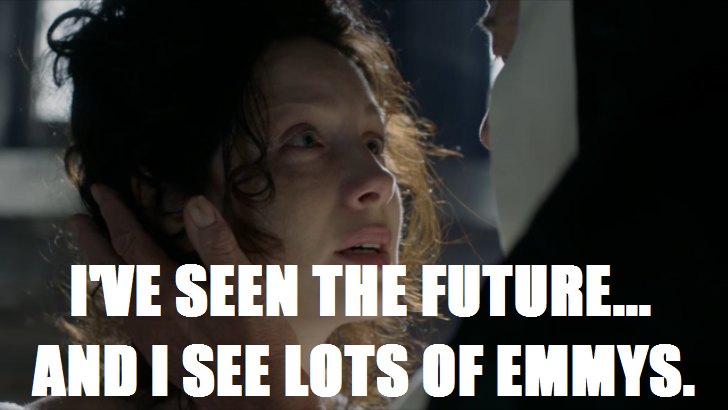 Now, let’s see if I can get though this installment of Outlander Superlatives without crying all over my keyboard. While we’re giving Caitriona Balfe all of the awards in existence, can we throw some at the entire ensemble too? Because Jesus H. Roosevelt Christ is this cast amazing. All I wanted to do was hug Fergus, high five Master Raymond, and donate all my worldly possessions to Mother Hildegarde. Even St. Germain slayed me when staring down his fate in a glass. Can we look into whether everyone in the cast is a direct descendant of Sir Lawrence Olivier? That would make a lot of sense. No face acting here! 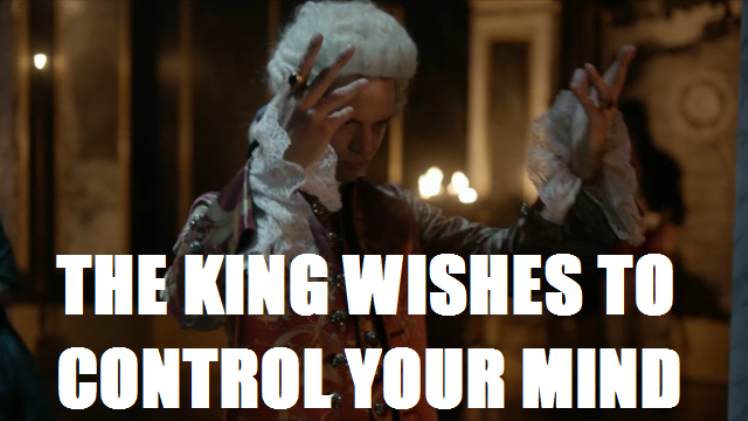 King Louis can literally command a room with a flick of the hand. If this whole royalty thing doesn’t work out, dude has a serious career ahead of him as an orchestra conductor. Thank God we had some levity in this episode, even if it was completely unintentional. I was like, “DANG, Jamie! What is that animal on your face and do you feed it regularly?” And then I went back to crying my guts out because feelings. Leave it to Magnus, a character who barely even registered on my radar in the earlier episodes, to turn me into a blubbering mess. SO much gratitude, pain, and every other emotion in the rainbow was conveyed when Claire reached him in the line of servants. I seriously can’t even type about it right now without crying. 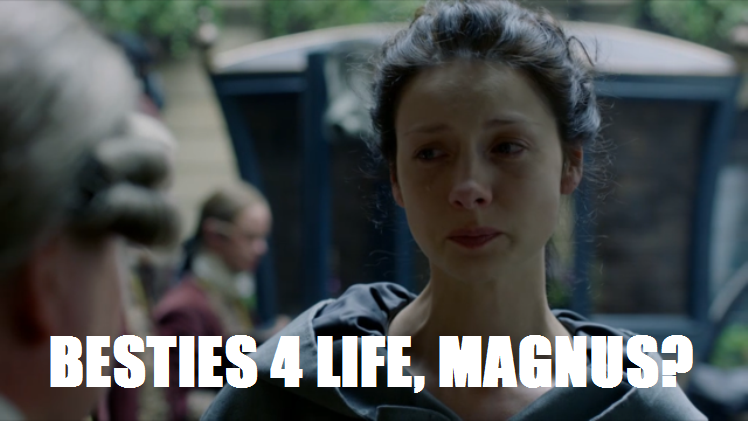 Even utter devastation and tragedy can’t keep Claire from being her fierce self. 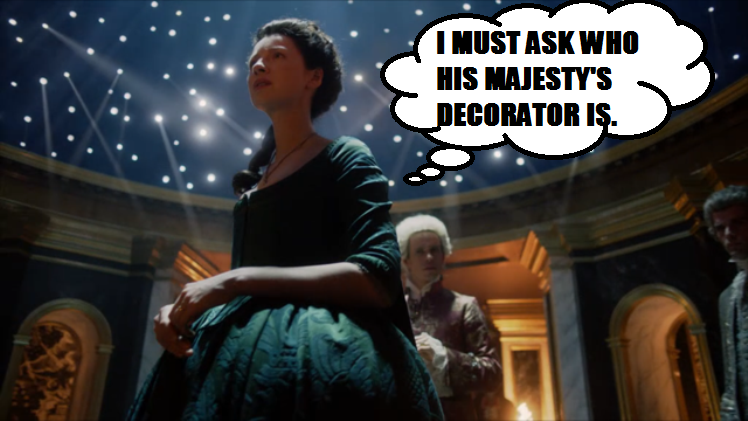 Her performance as La Dame Blanche in the king’s star chamber gave us Lady Broch Tuarach at her very best. Reading the darkness of St. Germain and Master Raymond? Using the bitter cascara? How does she come up with such things on her toes? If I were in her (definitely uncomfortable) shoes, I’d probably pull a total Bridget Jones and ask where the toilets were. Best Surprise – Brianna Freaking Randall! So what say you? 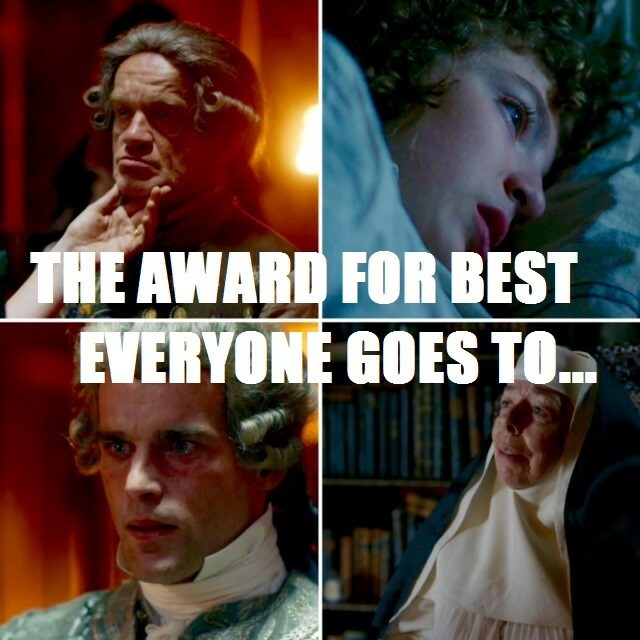 Do you see massive recognition for this cast and crew come award season? 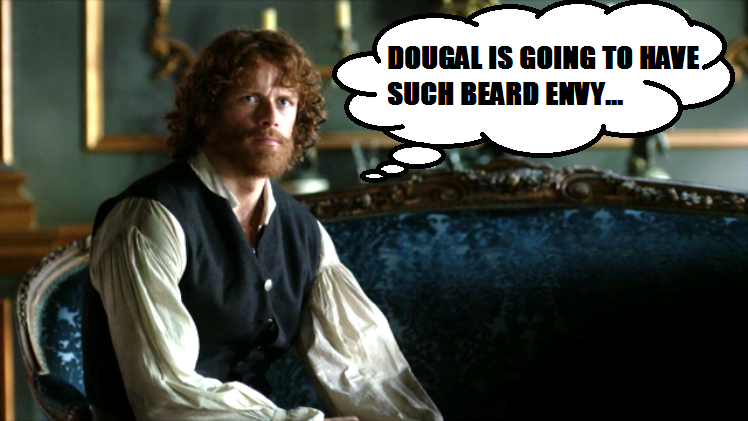 Do you miss Jamie’s new face pet already? And do you have any extra Kleenex I can borrow as I continue watching this show on repeat? I know!! I was really looking forward to the beard’s character development.